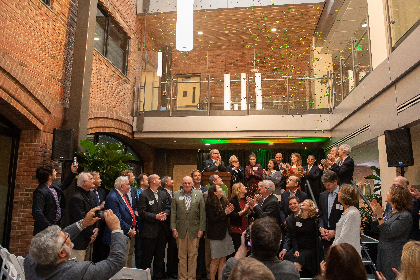 A buzz of excitement filled the air as the Grossman School of Business community celebrated the completion and opening of the Business School’s Ifshin Hall expansion with an official dedication ceremony on Thursday, October 4, 2018. The ceremony was graced with the presence of noted alumni, dignitaries, the school board of advisors, university faculty and foundation, UVM’s senior administration, Alumni Association Board of Directors and Foundation Board, students, staff and members of the Ifshin family, during which keynote speaker Adam Ifshin noted the symbolic relationship between the new addition that bears his family name, and the schools existing Kalkin Hall; namely that both are based in real estate, albeit one as a landlord and one a tenant. The ceremony was especially poignant due to the presence of Eugene and Joan Kalkin, after whom Kalkin Hall is named. 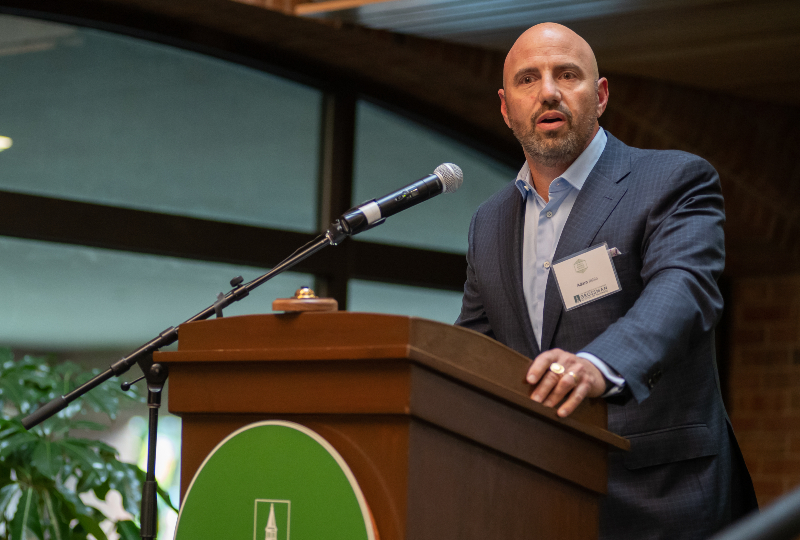 The 25,000-square-foot Ifshin Hall, named for the late Steve Ifshin, is completely funded by private donations, many from Grossman’s advisory board, who were recognized at the ceremony by the University of Vermont Foundation’s Board of Directors chair, Jim Keller. Ifshin Hall provides students with state-of-the-art educational facilities, designed to enhance their learning experiences with world class faculty and business leaders, and contains a multi-purpose event room, case rooms, classrooms, student study rooms, common areas and administrative offices.